Welcome to the introduction of the new Luminescence theme which gives you a quick overview of what features this theme offers, but also what is included and not included. Although the demo site looks great with lots of things happening in it, there are parts that are not included in the download. Plugins are not included because it's best to let the individual to decide what plugins they want, but it also assures that when they are downloaded as needed, you will get the latest version form the developers. The theme demo site also showcases a slider that is part of a plugin package called "Widgetkit". The Widgetkit is free to download, although they offer a pro version as well, but for the demo site, I used the Widgetkit Lite version. More on this later. Jetpack - Lots of added featured such as a CSS editor for doing custom changes to your theme, lightbox for the gallery, Contact Form, and more. It even lets you publish widgets to select pages too. Recent Posts Plus - A great plugin for displaying recent posts with thumbnails. 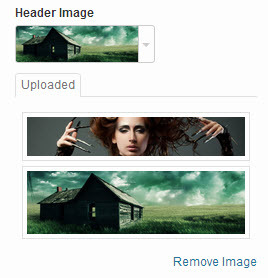 Widgetkit - Multiple plugins packed into one plugin, including a Twitter, slideshow, and image lightbox...and more. There may be times when you want to make changes to a theme but the theme settings does not have the options you want. This means you will need to modify the core theme files which WordPress does not recommend because should you make an update to the theme, you lose everything you changed. For this purpose, the child theme is the solution and this theme gives you one as part of the download package. More on child themes later, but if you plan to make theme modifications, it's best to install the child theme and activate it (you need the Luminescence theme installed for this to work). The first thing you will need to do is to download the theme to your desktop and then unzip the file "luminescence-unzip-first.zip" because inside this is your actual theme file. Find the unzipped folder "luminescence-unzip-first" and make sure the theme files are inside that and not a double folder named the same. If there is, then upload the folder that has the theme files showing in it. Find the Celestial Reloaded theme and click "Activate"
Using the theme installer that is part of WordPress is the better way because it's easier and definitely faster. WP Google Maps - A great plugin for setting up a Google Maps in your pages. Remove Widget Titles - Add custom, first, last, even, odd, and numbered classes to your widgets. Used to acheive the different widget styles that Luminescence offers. Widgetkit Lite - A widget toolkit by YOOtheme (You need to go to yootheme.com to get this) which includes a group of widgets that offer a great resource of functions like a fully responsive slider, thumbnail overlay, Twitter widget, and a great looking lightbox for viewing images. Luminescences uses this in the demo and recommended. Recent Posts Plus - This provides an laternative to the default WordPress recent posts widget by adding features, such as thumbnails. Some of these plugins will have their own video tutorial for you, and I will go through how to set them up. With Luminescence, you get several options that are built-into the theme to give you the ability to personalize your website by using the available customization features that come with this theme. Normally theme sites code in third party option panels, but I decided to keep to the official WordPress methods by taking full advantage of their built-in customizer (new to WordPress 3.4). With the Customizer, you get option tabs, each with a series of settings that let you customize your new theme in "real time"...which means as you make a change, you can see the result dynamically in the right side window. The benefit of this is that you can see what something looks like before making it official and live to the public. You have several ways to access the Customizer. If you plan to customize your theme, WordPress and Styled Themes recommends you use the Child Theme method instead of directly modifying the actual theme files. If you update a theme and you made modifications, guess what will happen? Your modifications will be totally lost and you will have to do it all over again. However, if you make your modifications using a Child Theme, then your changes will not be affected whenever you update the original theme (often called the Parent Theme). There is one other method that you can use to make modifications to your theme. Jetpack includes a great CSS editor that generates a custom css file and allows you to make css "only" changes to your theme. This means that you technically do not need a child theme installed if you only plan to change the stylesheet. So if you have Jetpack installed, under the Appearance menu in the dashboard, you will find Edit CSS. This video will get you started by installing the child theme for Luminescence. The child theme is now included with the theme and can be found in the folder that you unzipped the celestial-unzip-first.zip file to your computer. So...before we continue on with setting up Luminescence, we will change the default settings of WordPress so that this does not happen to us. But please note that this is optional and not required, but more of a recommendation. By doing the settings above, we will have all images in one folder and only and only one copy of each image we upload (the original). For any site, I would recommend cropping and sizing your photos as you need them before uploading so that you have full control over how your photos look and manage file size as well with optimization. I generally don't set any dimension in the Media Settings because of my preference to do my own thumbnails. Much more control that way. This video in this series provides an overview of how to setup your main menu when using the Luminescence theme. By default, you will get a fallback menu which contains only pages, so what we want to do for more flexibility is to create a custom menu. Familiarizing yourself with the WordPress menu manager. How to create a menu. How to add links to your new menu. By default, the blog layout is set to use the left sidebar column which is generally the layout for most blogs because it contains primarily links. Usually a blog with a right column is set for other elements such as banners, images, other text based content, etc. Familiarizing yourself with the Social Networking Options. How to enable the social networking bar. How to add links to each social network field. Previewing and saving your changes. This video in this series provides an overview of how to change the colours of different elements within your website when using the Luminescence theme. When changing colours, you can get virtually an unlimited array of colour combinations so that your site can look different from others that might be using Luminescence. Familiarizing yourself with the colour Options. How to use the colour selector. How to go back to the default colour. Introduction to the WordPress gallery feature. Setting up a page for our gallery. This video in this series provides an overview of how to choose your blog post to be content based with a read more tag or an excerpt. You get two options here, but you also get another feature that lets you decide how many words you want for your post excerpts. Introduction to the blog content post method. Choose how many words your excerpt will have. Luminescence includes the ability to change the copyright notice that is located at the very bottom of the page of your website. Getting the Recent Posts Plus plugin and setting it up. Using the widget to display recent (latest) posts with thumbnails. In your original download of this theme, there is a folder called "Recent Posts Plus", and inside this will be a text file that contains settings as well as a category setup and a recent post layout template you can use. You can also modify them to your needs as you feel fit. This tutorial will take you through the process of being able to disable widget titles without having to leave the widget title field empty. This comes in handy when you are loading an image, such as a header, or slider, into a widget position where you do not want a title showing. Introduction to widget titles and how it looks on your pages. Installation of the Remove Widget Title plugin. Creating a widget and disabling the title. This video provides an overview of available HTML code snippets that comes with the Luminescence theme. There are several snippets to choose from, but basically these are available instead of using shortcodes which are a little more difficult to manage if you ever need to make any modifications. With HTML, you can easily make changes with just a basic understanding of it, including CSS. Introducing you to the available snippets. This video in this series provides an overview of how to setup the Widgetkit slideshow that you see on the live demo front page. This is a free plugin that you can download and install with custom styling that I provided in the theme download package you got with Luminescence. Introduction to the Widgetkit plugin. Setting up the included template skin for your slider. Using the Widgetkit widget to display our slideshow. To Add a Spotlight to a Thumbnail - We need this code to the <a href> like this: data-spotlight="on"
To Add a Lightbox to our full sized Photo - We need this code added to the <a href> like this: data-lightbox="titlePosition:inside"
Introduction and installing the WidgetKit plugin. Setting up a single thumbnail image. We will have some work to do here to get ourselves ready to build our special custom gallery. What I will do here is post a couple snippets of code that we will be using, although editing to our own needs, primarily the paths to our images. To Group thumbnails into a Gallery - We need this code added to the <a href> like this: data-lightbox="group:mygallery"
Setting up your gallery page.